The same companies who produce lengthy, hard-to-read press releases create bloated, hard-to-understand products. It’s no coincidence; it’s all connected. Once a company succumbs to it, bloat seeps through its veins. A round of layoffs becomes a “Strategic Talent Re-Architecture”, sharing a link becomes “Internal Socialising”, or “Knowledge Cross Pollination”. You no longer “think about things” any more you “incubate them internally”. If you’re thinking about them really hard, you’re now “deep diving to disambiguate”. Companies making up their own phrases isn’t a problem. Every company evolves its own lingo over time. The difference is that good companies invent concise clear ways to talk about internal topics, whereas bad companies adopt bloated, vague phrases that few people agree on, and are then crippled with bad communications for their lifespan. Bad communications isn’t an internal matter – it oozes out through every pore. Blackberry are a company who once boasted the 42 button cellphone with multiple customisable “convenience” keys. The phone shipped with a 72 page user manual, as confusing as the phone it attempted to explain. 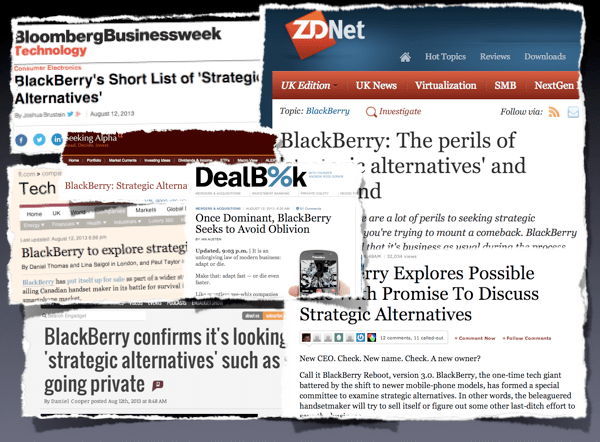 So it comes as no surprise that they are announcing a “Special Committee for the Exploration of Strategic Alternatives To Enhance Value and Increase Scale to Accelerate BlackBerry 10 Deployments”. Perhaps less surprising is the last sentence in their press release: “There can be no assurance that this exploration process will result in any transaction”. The only sentence everyone understood was the one that didn’t need saying. Maturity and duration management decisions are made in the context of an intermediate maturity orientation. The maturity structure of the portfolio is adjusted in anticipation of cyclical interest rate changes. Such adjustments are not made in an effort to to capture short term, day-to-day movements in the market, but instead are implemented in anticipation of the longer term secular shifts in the levels of interest rates. (i.e. shifts transcending and/or inherent in the business cycle. We will try to profit by correctly predicting future interest rates. When we have no strong opinion, we will generally hold intermediate term bonds. Buffett’s version is 70% shorter, says the exact same thing, and is understood by more people. Would you trust a fund whose manager happily wasted 70% of anything? Are you surprised Warren Buffett uses his words more efficiently? If you think this is a one-off, read any Berkshire Hathaway report – here’s the 2012 one – they’re as clear and concise a business communication as you’ll find anywhere. The same guy who writes 5 paragraphs more than necessary, writes 5 lines of code more than necessary. The same guy who adds a few words that aren’t needed, adds a few drop-downs that aren’t needed. The same guy who thinks “talent re-architecture” is clear, calls methods things like “ensure_data_transformation_okay”. Similarly, the person who makes every word count makes every pixel count. The designer who revises a paragraph until it’s just one sentence redesigns a sign-up flow until it’s just one step. It’s all connected. Communication is a skill. It must be practised and improved for your career to flourish. Too often this is overlooked. Developers and designers, CEOs and CTOs, marketers and support staff: the vast majority of what they all do is communicate. Mostly by writing. This is why the web is awash with advice such as hire the better writer, hire the one who can write, and how writing it down makes you smarter. Good communication is, as Stephen Robles noted, direct, clear, and concise. Direct in that everyone understands who is being addressed. Clear in that everyone understands what is being said. Concise in that no words are wasted in saying it.